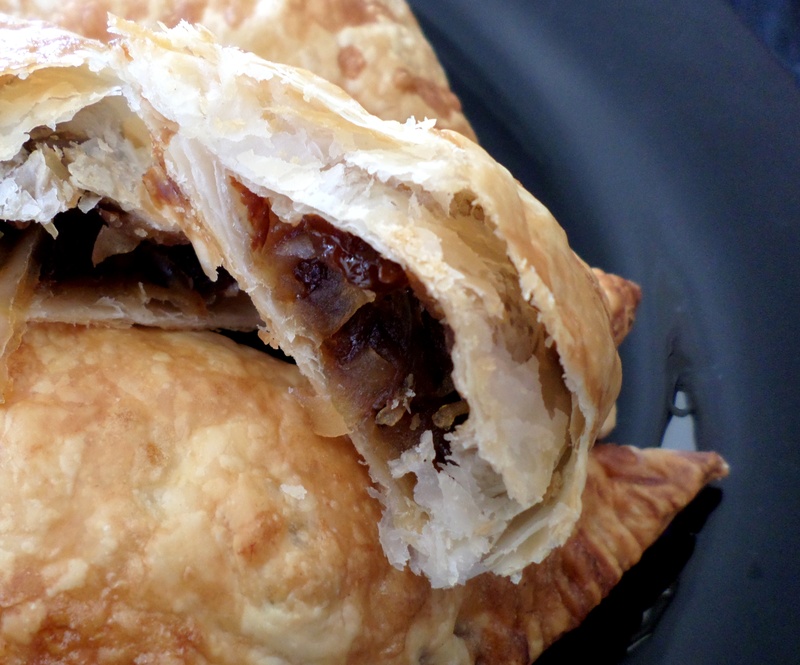 If you love the traditional Christmas fruit mince pies, then these are a perfect all-year round substitute. Plus, making them in this way is much cheaper than buying ready-made fruit mince from the supermarket. I used sultanas but you could use mixed dried fruit or just raisins instead. The key is to soak the fruit first, as that turns the little dried morsals into juicy gems. You could also add cinnamon or mixed spice if you like – they don’t really need it though. These are a reasonable size when they are baked. Eat them as a treat on their own, or as a warm dessert with ice cream. If you are making these for kids then either leave out the liqueur or replace it with orange juice. Put the sultanas, sugar, water and orange liqueur into a medium bowl. Stir until the sugar disolves then leave to soak for at least 30 minutes. You can cover with cling wrap and put in the fridge overnight if you have time. Heat your oven to 200C/180C fan forced/390F and lightly coat two baking trays with cooking spray. Coarsely grate the apples – no need to peel first but do remove the cores. As soon as they are grated put into a medium bowl and stir in the lemon juice. This will stop the apples from going brown. 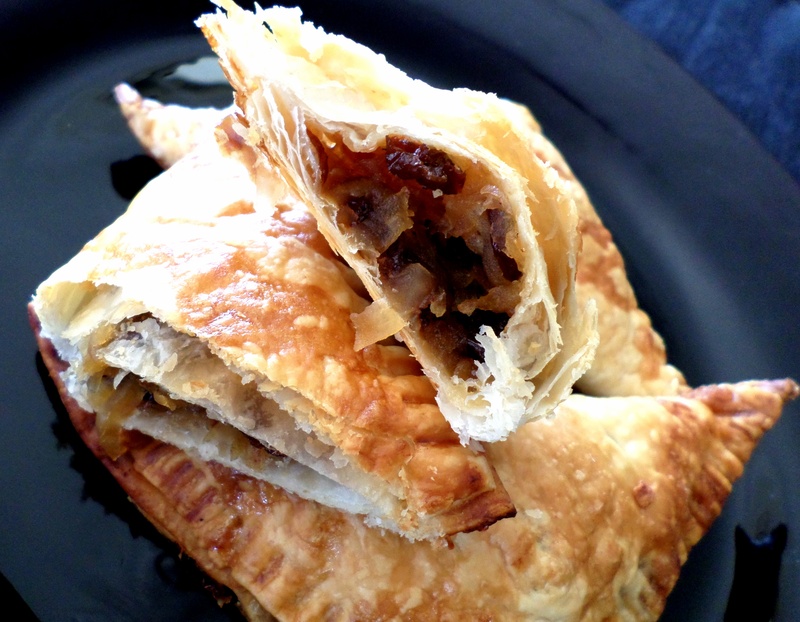 Cut your thawed pastry sheets into quarters so you have 12 squares. Drain any excess liquid from the sultana mixture, then mix in the grated apple. Divide the fruit mixture between the 12 pastry squares. Brush the edges of each piece of pastry with a little milk, then fold the pastry diagonally to enclose the fruit filling. 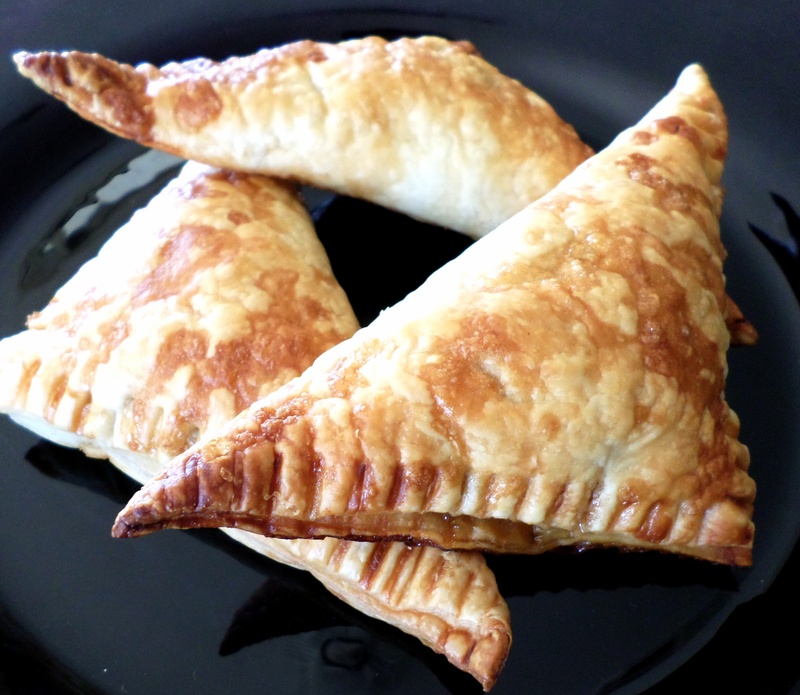 You should end up with 12 triangular turnovers. Place the turnovers onto your prepared baking trays then brush the tops with milk and sprinkle over a little brown sugar. Leave on the trays to cool for 5-10 minutes before serving. This entry was posted in Baking and tagged Apple, Baking, Desserts, Food, Fruit, Holidays, pastry, Pies, Recipe, Recipes, Snacks. Bookmark the permalink. I love the idea of baking with booze. You could have these for a sneakily boozey morning tea treat at the office.